Sometimes travelers without children can feel left out of the fun. Sometimes they can feel self-conscious about visiting an attraction ostensibly “for kids” if they’re not parents themselves. This can be especially true in places like candy stores, where the bright colors, sweet confections, and games seem designed for younger visitors. However, the Jelly Belly Candy Company in Fairfield, CA has gone out of its way to ensure adults, whether they have children-in-tow or not, will feel welcome and have fun. For those who want an elegant affair without little ones running around, Jelly Belly offers this adults-only experience. Partake in daily tastings and sample up to five local wines from the Suisun Valley. 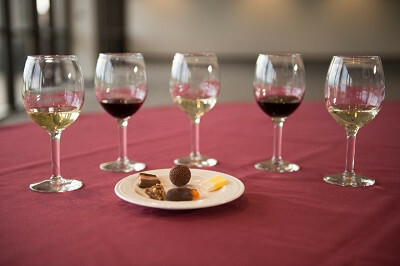 Each wine is paired with decadent, hand-made chocolate confection from the Chocolate Shoppe. In fact, the finishing touch is a 2013 Late Harvest Dolcetto served in an edible, dark chocolate-molded cup. There’s also a non-alcoholic option for adults who don’t care for wine but still wish to partake in the experience. Take the chance to unwind and chat with other adults in a relaxed atmosphere while still getting to enjoy Jelly Belly’s classic sweets. Bottles of the showcased wines are available for purchase, and each participant will take home a complimentary souvenir wine glass to commemorate the experience. 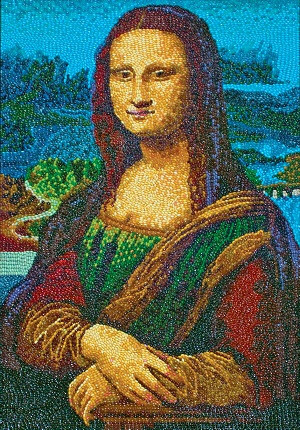 For those who love art, come appreciate jelly bean recreations of famous masterpieces like “American Gothic,” “Girl with the Pearl Earring,” and “The Mona Lisa.” From a distance, they could almost be the real thing, but as guests get closer, they can appreciate the intricate mosaic of thousands of jelly beans that create the works. Stroll through the gallery past portraits of endangered animals, Marilyn Monroe, The Beatles, Martin Luther King Jr., Benjamin Franklin, and Amelia Earhart. Discover how these detailed and delicious works of art are created, with the first piece, a portrait of former president Ronald Reagan, having taken over six months to finish. A hit among adult visitors, guests can feel like they’re touring a fine arts museum without ever having to leave the candy factory. The best thing about a self-guided tour is that guests can go at their own pace, lingering on what interests them without having to rush to keep small children in the group happy. The HD/4K quality videos throughout give an up-close-and-personal look at candy manufacturing, going into detail about the process that both the technical- and culinary-minded will appreciate. That’s not to say the tours are all work and no play. Interactive exhibits are designed for visitors of all ages, so they’re simple enough for children but challenging enough for adults. Test hand-eye coordination at the Belly Flop IQ station, where guests must use touch technology to separate misshapen or wrong-colored jelly beans from the good ones. Athletes can try Bean Blitz, where they act as a goalie trying to keep a giant, virtual jelly bean from getting into their net. At the end of the day, the Jelly Belly Candy Company is a place for everyone, so no matter their age, any guest will feel like a kid in a candy store.